Video PSAs for Narcotics Anonymous were created in the mid-1980’s and a few members think they should be revisited for updating. 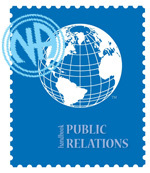 The current vision of public relations at NA World Services is to create new video content as a part of the PR Plan (as of WSC 2006). 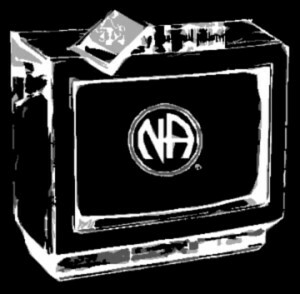 Contact NA World Services for price and current availability. 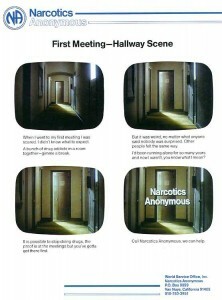 The videos are available in lengths of 10 and 30 seconds in the English language only. 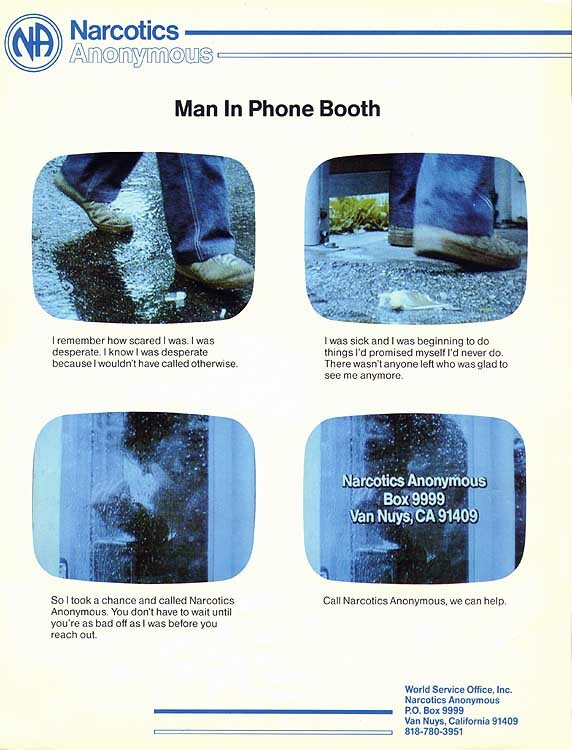 Regardless of length, you can choose a different “trailer” for each video; one with NAWS contact information or one that is blank so that graphics can be inserted onto the tape (phoneline or other contact local information). These video tapes were available from NAWS in three formats for broadcasting in the 1990’s: three-quarter inch, one inch sizes and digital Betamax (a copyrighted trade name). For use in display booths or to preview these different PSAs, VHS format is available – PAL format included. This VHS format is not suitable for broadcasting. Today, television stations in most industrialized countries have converted to digital equipment which require a digital format, most commonly the digital Betamax format. 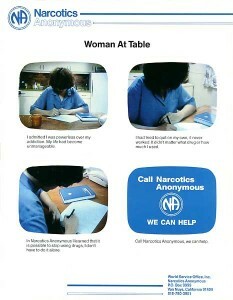 In recent years (as of 2012) broadcast and cable companies are accepting DVD copies of the PSAs even though they are not traditionally “broadcast” quality. Although not created for public information use, the “Just For Today” video is available in broadcast quality format (digital Betamax) and even on DVD. PI Subcommittees are now utilizing this the video on local cable “community” channels and even in presentations. 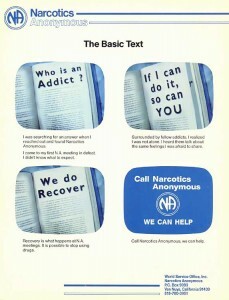 This video was designed to be sold to treatment/therapeutic communities in orienting their clients to Narcotics Anonymous. 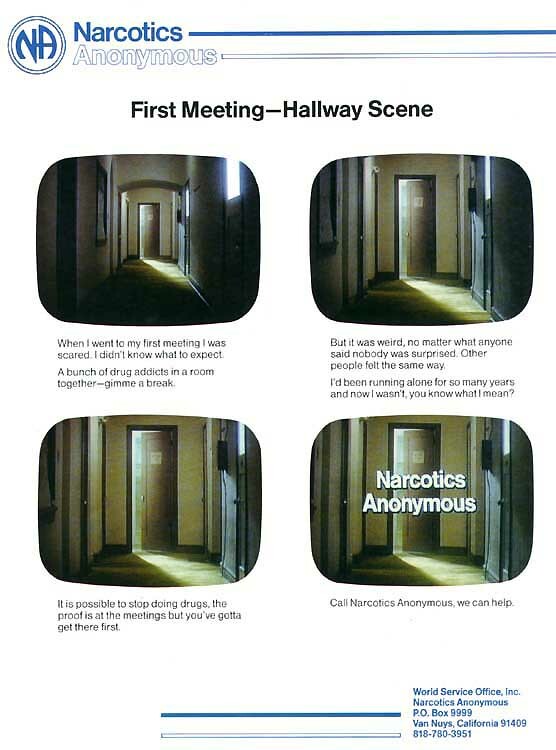 Story board for "First Meeting Hallway"
Also included with the purchase of the video PSA is a “PSA Campaign Cautionary Statement”, which gives advice on preparing the Fellowship for the possible results of a video PSA campaign (available on this site in English – PDF File, Rich Text File , Plain Text File ). For some tips on doing a video PSA project, see the Video PSA Project Tips page.